At custommagnetsdirect.com, we offer a 10.5x5.5 postcard with 3 perforated coupons at a cost effective price. This combo offer was specifically developed and designed keeping the low budget advertisers in mind. This combo product can be used for making announcements and spreading business messages. 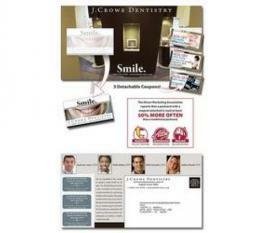 The custom business card magnet attached with the postcard offers plenty of space for displaying business information. These magnetic business cards contribute to a fridge art and it will keep on promoting the business for a long time. Mailing Forms are included in the template file. Postage is extra. Postcards are not automation compatible mail.